We offer a wide range of massage therapies. Massage therapy is a skillful manipulation of the muscles and soft tissues of the body. It is an alternative therapy valued since ancient times and its medium is safe touch. Massage promotes healing and relaxation. A successful massage will yield physiological, psychological, and emotional benefits. 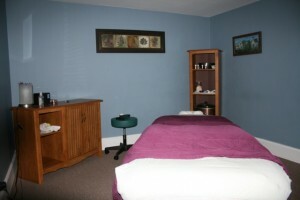 Our therapeutic massages are conducted in private rooms on professional massage tables. Massages vary from therapist to therapist as each has a unique approach to their healing touch. Take a moment to learn about our therapists and rates before you schedule your massage. We use a simple online scheduling service that lets you pick the therapist and time of your appointment. It even reminds you via email the day before your massage. Our regular customers really like it. Swedish massage is generally considered for reducing muscle tension and overall body stress, with the main goal being to relax the mind and body. This technique utilizes light to medium pressure with long sweeping strokes, kneading, and gliding over the superficial layers of muscle tissue. Swedish massage increases vascular circulation, facilitates the release of built up toxins in tissue, and encourages increased joint mobility with active or passive stretching, and range of motion movements. Myofascial release or deep tissue massage can be used for areas of chronic pain due to tightness in the fascia or connective tissue. By using medium to deep pressure with long stretching strokes and manipulation of the muscles, the “glued down” areas are released. This facilitates the release of muscle spasms and pain cycles, allowing your body to connect with it’s Wisdom functioning with greater movement and ease. Hot stone massage is a specialty massage that uses smooth, heated basalt and river stones to help relax and release tight muscles. The stones are heated in water and then placed at specific energy points on the back, in the palms of the hand, or between the toes. Your therapist will hold the stones and use them to massage certain areas of the body. The heat warms and relaxes the muscles, which allows the therapist to apply deeper pressure. The warmth of the hot stones may also improve circulation, calm the nervous system, open tight joints, and ground energy systems providing peaceful relaxation of mind and body. Share a room in our newly remodeled serene suite and receive a massage side by side in the company of a loved one, friend, sister, or mother. This is truly a wonderful experience for everyone! Healing Touch is a gentle and relaxing energy modality, which aims to at detecting and correcting imbalances in your body’s energy field and harmonizing the energy flow, thus enhancing the body’s ability to self-heal. It can help with a variety of health concerns, including improving anxiety, depression, or stress symptoms, decreasing pain, supporting immune function and recovery from surgery or illness. The treatment is usually done with the client fully clothed on a massage table, and it is also effective in conjunction with other modalities. A healing touch session and customized massage is based on your body's needs and a recommendation by your therapist Birgit. Enliven the energy in your face, neck, and shoulders. Pure, Vegan Arbonne Products, warm towels, acupressure and our specialized facelift techniques will help reenergize, revitalize, and bring back your youthful glow! Additional glow, warmth, moisture & nutrients. Your therapist will use various lengths of warmed bamboo sticks to knead the muscles and stretch the fascia in all direction more deeply. This innovative addition to your deep tissue or Swedish massage promotes circulation, sensory nerve perception, and lymphatic drainage and provides a deep full body warming and relaxation. The Bamboo Massage technique aims to relieve stagnation and improve the vital life energy flow in the body. The bamboo pressure is applied to the skin and encourages blood circulation while removing the body’s toxins, The sticks are made from 100% solid bamboo which is a ecological and sustainable resource. This may be the gift that this seemingly simple material offers strength, flexibility and versatility. In the normal heathy state, fascia is relaxed and has the ability to stretch and move without restriction. It covers and connects every tissue, muscle, vein, artery, nerve and organ together including the brain, lungs, spinal cord and heart. You begin to have issues like tension, headaches, dimples (cellulite) on the surface of the skin, restriction of movement and an inability to withstand stress when fascia becomes unhealthy. In order to heal the fascia the old tissue must be broken down so tissue can grow and renew the areas. It takes a great amount of deep pressure to break down the fascia. Your therapist will use the fascia blasting tool created by Ashley Black to perform a deep tissue massage. As with any deep tissue massage there may be a small degree of discomfort during the massage process. Since fascia blasting yields the best results when done in a series of treatments, you should expect some lasting soreness during the beginning. Some clients also experience bruising: this is normal as you are breaking down tissue in order for it to heal. We recommend a 2 hour treatment and then follow up for maintenance. Reiki is a form of energy healing that can help alleviate physical, emotional, mental and spiritual stress. It is a way to ‘tune-up’ your energy to it’s healthiest state allowing for healing to take place. Reiki is a healing practice that is based o the body’s ability to heal itself naturally once energy blocks are removed. During a session your practitioner places her hands on you with the intention of the Reiki Energy to flow. This Reiki Energy, also known as the Universal Life Force Energy, is not the practitioner’s energy, it is a divinely guided energy that clears energy blocks and is then filled with the original pure essence or your expression of the divine consciousness to complete the balance of the session. During a session a person may feel heat, tingling or cooling sensations as blocks are removed. Most all clients get tot a deep state of peace and relaxation during a session. Reiki and a Custom Massage based on your needs. The raindrop technique involves the amazing power of our young living essential oils, mixed with massage techniques including back massage, reflexology and heat application. The technique is designed to bring the body back into structural and energetic alignment. You will feel like royalty when we cleanse and exfoliate your tired feet, calfs, and ankles with our hydrating sugar scrub, soothed with warm towels. Restore healing with our reflexology treatment, based on the idea that each of our body’s systems correspond to a point on the feet. Melt away with our luxurious aromatherapy foot massage and finish with a heated paraffin treatment while we massage your choice of either hands or scalp. Our body scrub uses exfoliation gloves to buff and remove dead skin cells while stimulating and improving blood and lymph circulation. It also revitalizes and firms the skin while re-establishing natural moisture levels. It is known to nourish, oxygenate and detoxify the skin. It will help calm you and will also help the body to fight infection, accelerate waste removal, ease muscle aches, arthritis, rheumatism, joint disorders and many common skin complaints. Your skin will glow, feel invigorated, and look radiant! A gentle full body buff removes surface skin cells, stimulates your circulation, hydrates and renews your skin to feel and look soft and silky. Pleasantly scented with lemon, orange and lime essential oils. Your body will be fully prepared for a recommended custom massage with Young Living essential oils of either Lemon, Lavender or Thieves. Thai Massage is an ancient form of massage thought to have been developed by Buddhist monks in Thailand 2,500 years ago. Our practitioners will use the weight of their body to move your body into various positions to achieve passive stretching while applying gentle pressure along the body’s energy lines to increase flexibility, relieve muscle and joint tension and balance the body’s system. Thai massage takes place on a futon mat on the floor while you are fully dressed in comfortable clothing. Thai massage typically works with compression and rhythmic pressing movements directed into muscle tissue. Our therapist uses a variety of different sequences of techniques while you are either laying face up, laying face down, seated, or on your side. The therapist is also on the mat and moves your body into various stretches and positions, without any work on your part. Our therapist uses her hands, knees, legs, and feet to move you into a series of yoga-like stretches and also applies deep muscle compression, joint mobilization, and acupressure. Thai massage also utilizes energy work and treats the subtle energetic field within the body. Thai massage can be both relaxing and energizing. It’s a great addition to your healing or to help you to deepen your stretching routine, heal aches, and balance and align your whole body! There are reflexes in the feet, hands and ears and their referral areas within related zones, which correspond to every part, gland and organ of the body. Reflexology is a focused pressure technique, usually directed at the feet or hands that stimulate the body’s natural electrical energy along the nervous system to clear any blockages in the corresponding zones. Pressure applied to any part of a zone will affect the entire area and can be stimulated by working any reflex in that same zone. This promotes relaxation, improves circulation, reduces pain, soothes tired feet, and encourages overall healing. CST is a gentle, hands-on method of evaluating and enhancing the functioning of a physiological body system called the craniosacral system. Using a soft touch to release restrictions in the craniosacral system helps improve the functioning of the central nervous system allowing the body to relax and self-correct. By complementing the body’s natural healing processes, CST is used as a preventive health measure to strengthen resistance to disease, and is effective for pain and dysfunction. Because it is so gentle, CST can be effective for all ages, newborns to elders. Pregnancy massage is a wonderful way for expectant mothers to take care, listen to their body, and connect with their growing baby. Massage therapy performed during pregnancy can reduce anxiety, decrease symptoms of depression, relieve muscle aches, joint pains, and improve labor outcomes. Swedish massage is the main technique used during a pre-natal session. It is great for reducing muscle tension and improving lymphatic and blood circulation. It successfully addresses many of the discomforts a mom to be experiences with the skeletal and circulatory changes brought on by hormone shifts during pregnancy. Other benefits are improved sleep, reduced edema, relief in back pain, and reduced stress levels. We encourage this gift to yourself and baby. Essential oils are a wonderful way to extend and enhance the therapeutic benefits of your massage. Weather the concern is physical, mental or both, you and the therapist will work together to choose which oil would bring the most benefit to your session. If you would like to continue the healing after you leave we offer this wonderful treat, which consists of 10 drops of your oil along with a sea salt bath with your oil. We suggest the bath the evening of your massage and to use the oil one drop at a time throughout the following days. This is a great way to bring yourself back to a state of relaxation in your day to day life. This wonderful treatment increases circulation, can help reduce joint inflammation, pain/stiffness, and soothes overworked, tired, and achy hands and feet. One of the overlooked benefits of paraffin therapy is that it soothes and moisturizes the skin, opens pores, and promotes a sense of calming. Seated or chair massages utilize a specially designed chair to give clients a short, invigorating massage that can be enjoyed during the workday or at a specially arranged party or event. These massages allow the client to remain fully clothed and only require 10-20 minutes each. For more information on how to bring our chair massage services to your home party, workplace or special event, call (734) 424-2800.